Muncher Cruncher: get your kiddies moving! As I have been preparing to speak to a youth group about the importance of health and exercise I've been reviewing statistics about childhood obesity, and it really is shocking. In the United States 1 in 3 kids are considered overweight or obese. 1 in 3!!! 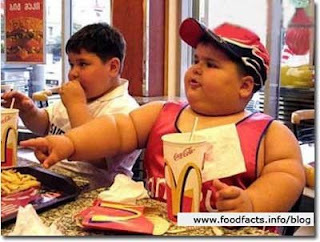 The saddest part about that...it's almost a given that these overweight kids will grow into overweight adults. I've studied several cases involving overweight children and the parents health and activity level has a lot to do with the child's health and activity level. Hence; sedentary parents often times produce sedentary children. My plead? Get your kids active!! Make it fun. They don't have to be "exercising" just moving. 43% of adolescents watch more than 2 hours of TV per day. Turn of the tube and get those kids outside, take them roller skating, go sledding, go for a bike-ride, have a dance contest...do SOMETHING. Getting them into the habit of being active now will benefit them immensely in the future. Introduce healthy foods to them. Most importantly...be an example. Be an example of healthy eating, exercise, and taking care of your body. A great family activity is looking over the Food Guide pyramid. Explain the different areas, and the newly added exercise portion. CLICK HERE for a link to Mypyramid.gov, a great, kid-friendly, informative website. Be a part of stopping this growing obesity epidemic that is killing America, one french fry at a time! Oh my gosh why am I laughing right now. It is so sad! I just can't help but think of Bronson. Someone was telling me they made their kid run around the block and they followed him in the car. How mean is that! Exercise is so important. We have Bronson playing basketball right now. His face is so red by the end of the game but it is awesome! We got Wii fit to get those bodies moving while having fun. It really does work. It can work the other way in reverse! All of you guys (our kids) are a total inspiration to me! You are all awesome! Amen, Megan! As you said, it doesn't have to be "exercise" (in fact, it shouldn't be!) -- just good, old-fashioned active play. The formula is energy in/energy out. In other words, if a healthy weight is to be maintained, the number of calories burned has to equal the number of calories consumed. Ahh I saw this fat kid eating an ice cream cone and I was like heeeeelllllooo mom of fat child...get that ice cream out of her hand and get her to a gym!